Mike Vergara serves as outside litigation and general counsel to businesses and public entities that have environmental law issues. His deep knowledge of air, toxics, hazardous waste, and water quality law allows him to help government agencies and private companies with not only their daily business needs, but to adeptly deal with environmental issues that can quickly inhibit their operations. Several industries, in particular, rely on Mike because of his in-depth understanding of how their industries operate. Telecommunications companies, utilities, ports, shipping, and trucking operations hire him because of his ability to combine his specialized knowledge of their industries with environmental compliance expertise and sound business strategies. 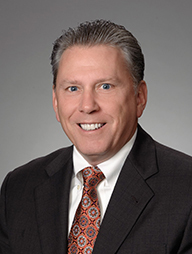 Before his career in law, Mike spent a number of years as a journeyman parts man selling parts for big rig diesel trucks and semi-trailers—a background he calls upon frequently to understand shipping and trucking operations. Mike is known among his clients for staying on the cutting-edge of environmental regulations such as California’s evolving cap-and-trade program, programs administered by the California Air Resources Board, and CERCLA and RCRA actions. He has 25 years of experience with the agencies that regulate California’s environmental laws and with litigating environmental cases. A fierce advocate for clients, Mike can also quickly find areas of agreement between agencies and clients, allowing businesses to spend less time and money arguing issues, freeing them to focus on running their businesses. One of the most fulfilling aspects of practicing law for Mike is the rewarding client relationships. He likes learning about his clients’ businesses and the interests his clients have when they are not working. Mike also makes a point to have a variety of his own pursuits outside of law—the latest of which is finally learning to play piano. Advise commercial property owner regarding Notice of Violation under Water Code section 13267, et al., issued by the Central Valley Regional Water Quality Control Board. Defend Peters Trucking Company against Notice of Violation under Water Code section 13267, et al., issued by the Central Valley Regional Water Quality Control Board. Advise the City of Reno regarding source control of PCE contamination, and draft ordinance creating permit system for dry-cleaners operating in the City. Advise potential purchaser of commercial property located at McClellan Air Force Base on environmental issues impacting the property, and potential liability. Advise developer of Mountain House Community Development regarding environmental issues affecting the project. Advise Shriners Hospital regarding issues relating to remedial action impacting the client’s real property located in Yolo County. Defend recycler of unused military munitions against an enforcement action commenced by the Department of Toxic Substances Control for alleged violations of California’s Hazardous Waste Control Law. Advise oil recycler regarding potential acquisition of used oil transfer facility in Lancaster, California. Advise aggregate mining company regarding its effort to purchase an aggregate mine located in Alameda County. Advise client regarding acquisition of three Northern California cement plants. Advise client regarding issues relating to a chabazite mining claim located in Arizona. Advise Mid-Peninsula Open Space District regarding environmental issues affecting demolition of Almaden Air Force Base, and availability of funding from the U.S. Department of Defense under the FUDS program. Advise Plumas-Sierra Rural Electric Cooperative regarding environmental issues relating to acquisition of Sierra Army Depot. Represent landowners in Reclamation District No. 1004 regarding effort to qualify recall election. Serve as contract City Attorney for the City of Isleton. Negotiate contract on behalf of the City of Redding for the lease and maintenance of a Catalytic Absorption System for the City’s peaking power plant. Advise the City of Redding regarding contamination discovered at its intermodal transportation facility. Advise the City of Roseville on issues relating to California’s electric power restructuring. Advise Michigan electric utility regarding the impact of Clean Air Act and Climate Change legislation on its operation of a coal-fired electric power plant. Advise Save Mart Supermarkets regarding compliance with San Joaquin Valley Air Pollution Control District regulations. United States v. Atl. Research Corp., 127 S.Ct. 2331 (2007). Kotrous v. Goss-Jewett, 2005 US Dist. Lexis 18013 (E.D. Ca. June 16, 2005). Kotrous v. Goss-Jewett, 2005 US Dist. Lexis 18014 (E.D. Ca. Aug. 23, 2005). Hillside Dairy v. Kawamura, 317 F.Supp.2d 1194 (E.D. Ca. 2004). Util. Cost Mgmt v. Indian Wells Valley Water Dist., 26 Cal.4th 1185 (2001).